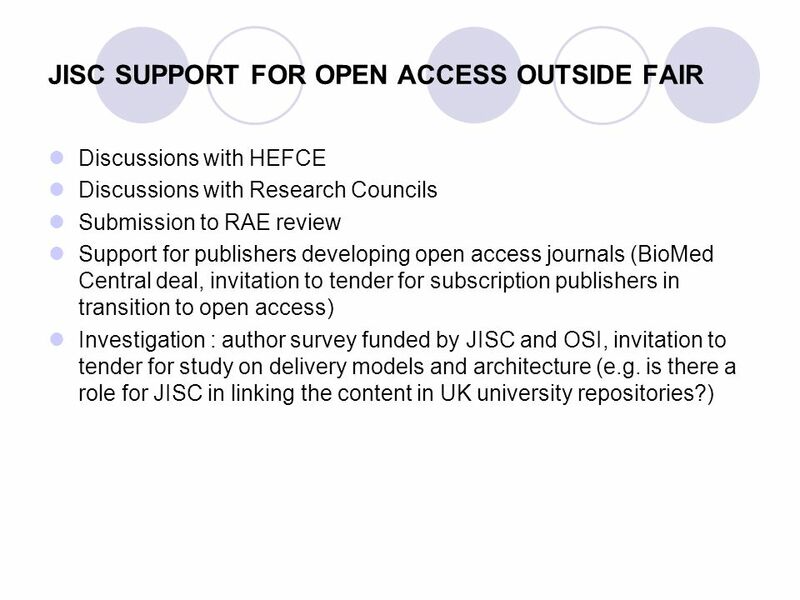 ACHIEVING OPEN ACCESS TO UK RESEARCH : THE WORK OF THE JOINT INFORMATION SYSTEMS COMMITTEE Frederick J. Friend OSI Open Access Advocate JISC Consultant. 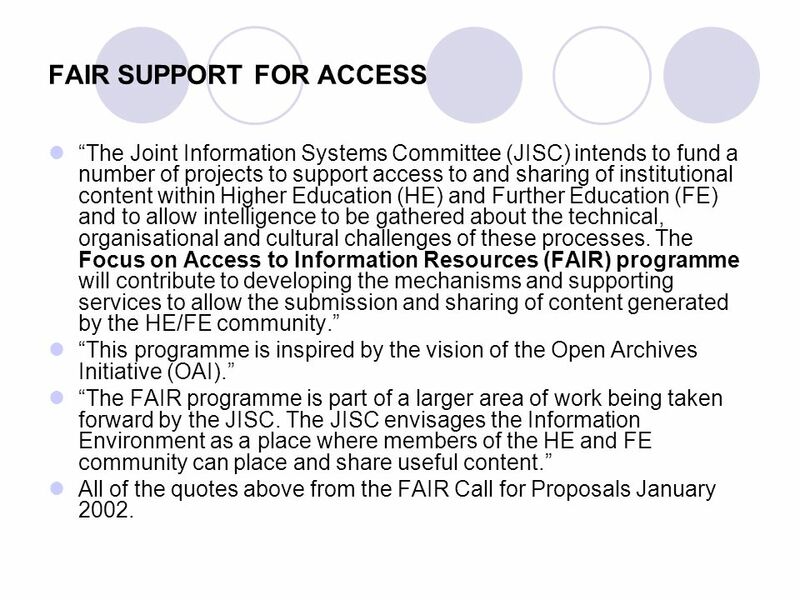 2 FAIR SUPPORT FOR ACCESS The Joint Information Systems Committee (JISC) intends to fund a number of projects to support access to and sharing of institutional content within Higher Education (HE) and Further Education (FE) and to allow intelligence to be gathered about the technical, organisational and cultural challenges of these processes. The Focus on Access to Information Resources (FAIR) programme will contribute to developing the mechanisms and supporting services to allow the submission and sharing of content generated by the HE/FE community. This programme is inspired by the vision of the Open Archives Initiative (OAI). 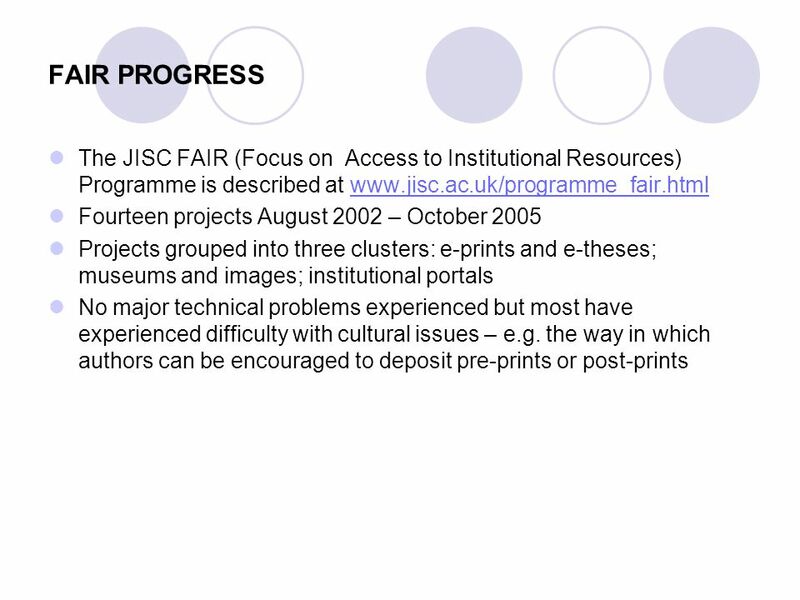 The FAIR programme is part of a larger area of work being taken forward by the JISC. The JISC envisages the Information Environment as a place where members of the HE and FE community can place and share useful content. All of the quotes above from the FAIR Call for Proposals January 2002. 5 HOW CAN WE MAKE FURTHER PROGRESS? Establish repositories in every university : cost concerns need to be overcome Create structures to validate repositories, link them and harvest their content : overcome view that repository deposit is anarchic Establish expectation or requirement that reports resulting from all publicly-funded research will be available on open access (Parliamentary Enquiry, statements from research funding agencies) Develop reasonable relationship between deposit of pre-print/post- print and published journal article : overcome reluctance of publishers to allow deposit on open web-site and overcome academic fears that self-archiving will destroy their publication opportunities Establish more open access journals on viable business models : overcome fear that open access will destroy academic publishing and stop learned society support for scholarships etc. 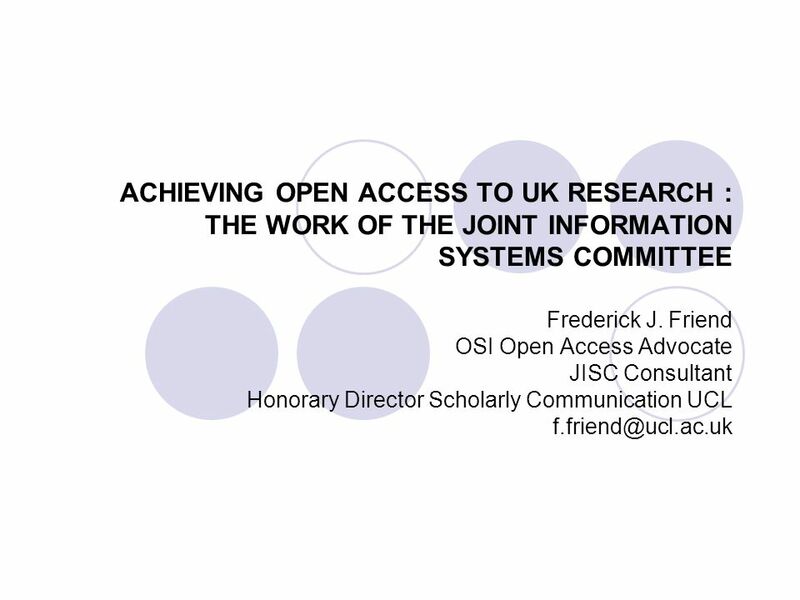 Download ppt "ACHIEVING OPEN ACCESS TO UK RESEARCH : THE WORK OF THE JOINT INFORMATION SYSTEMS COMMITTEE Frederick J. Friend OSI Open Access Advocate JISC Consultant." 1 KHAZAR UNIVERSITY INSTITUTIONAL REPOSITORY Tatyana Zaytseva February 18, 2011. Introduction to Open Access December 2001, Budapest OSI meeting of leaders exploring alternative publishing models. Defined term Open Access Concluded. E-Print Repositories for Research Visibility: T ime to Deposit Pauline Simpson and Jessie Hey 06/11/03. Joint Information Systems Committee Research Management and Institutional Repositories Neil Jacobs. Supporting further and higher education Eprints Software Roundtable 23 rd June 2004. E-Print Repositories for Research Visibility: T ime to Deposit Pauline Simpson and Jessie Hey 17/10/03. IMPROVING ACCESS TO ACADEMIC CONTENT : JISC working for UK teaching and research Frederick J. Friend OSI Open Access Advocate JISC Consultant Honorary. Institutional Repositories and Self-Archiving Crisis? What Crisis? Bill Hubbard SHERPA Project Manager University of Nottingham. Institutional repositories and SHERPA Stephen Pinfield University of Nottingham. Why self-archive? Elizabeth Harbord Head of Collection Management. The Glasgow Experience: From DAEDALUS to Enlighten William J Nixon and Morag Greig Glasgow University Library IUA Librarians Group, 20 th February 2007.